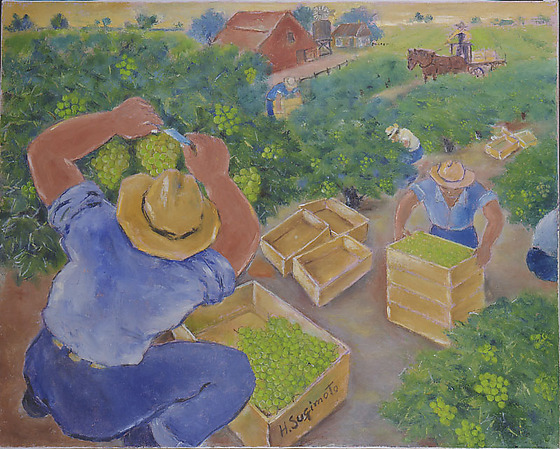 Workers picking grapes in grape arbors. 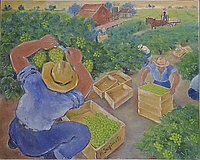 A man with his back to the viewer crouches in lower left over a half filled box as he cuts a bunch of green grapes off the vine. Another vine fills the lower right corner. Right midground, a man stacks full boxes of grapes, four high, next to three empty boxes. Three other workers are visible in the green arbors which stretch out to the upper right. The men are dressed in jeans, shirtsleeves and hat. A man in overalls on a horse drawn cart approaches one of the workers stacking boxes. A farm house with a red barn, water tower and windmill stands in the background center. More green fields are visible in the distance under a yellow sky.